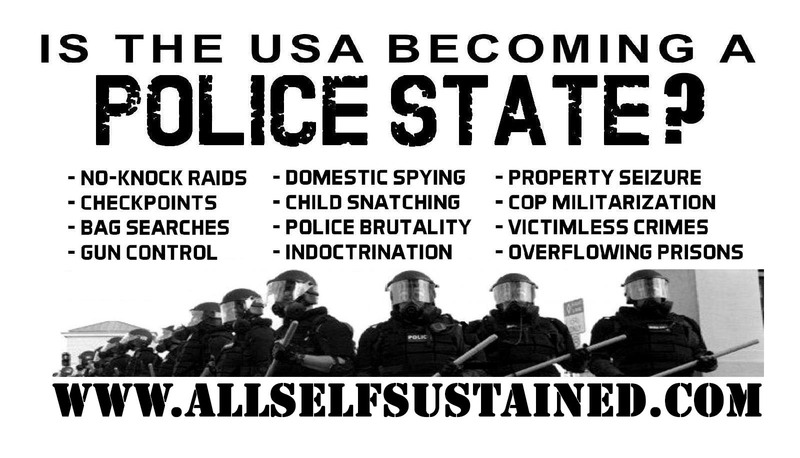 Are We Living In A Police State? If Someone Broke Into Your House Are You Just Going To Sit There If You Have The Means To Protect Your Family? Imagine that one evening you’re at home getting ready to go to bed and suddenly there’s a knock on your kitchen door. Nobody ever knocks this late and you’re a little nervous, so you cautiously get up to see who’s there. Suddenly it explodes in and five or ten guys in full combat uniform swarm through the door. They knock you down and drag you outside and one of them sits on your back and cuffs your hands together while the other points a rifle at your head. Your wife is dragged screaming from the house and subjected to the same treatment. Your fourteen year old daughter is brought out with a gun pointed at her head and from inside the house you hear a gunshot as your dog is shot and killed. Then one of them tells you that they’re a SWAT team doing a raid on the house because an informant has given them your address. The men search your house and after a couple of hours come back to you, pull you to your feet, and apologize saying they were given the wrong address by their druggie informant. Sorry about that and see you later. They leave and your door is hanging open on broken hinges, your dog is dead, your wife and daughter are completely traumatized, and you feel like you’ve just be victimized by the good guys. Think again. This kind of thing happens all the time around this great country of ours. I’m not here to bash the police. Most of them are just guys out doing a tough job and trying to make the best of it. I will say that police work does seem to draw a higher percentage of “tough guys” than other jobs, but I think that’s just the nature of the beast. I’ve known many cops and early in my college career (fresh out of the Corps) I was studying to be a state police officer. That changed when I took a class on child abuse and I realized that line of work wasn’t the place for a young hothead like me. The instructor was a twenty year vet with some of the most awful stories you can imagine. I figured I’d walk into a house somewhere and see something terrible being done to a child and I’d pop someone right in the forehead with a .40 cal – then I’d be in jail. It was a tough decision, but I changed my major after that class. A lot of times these raids are done for something as benign as marijuana. In this story the cops banged on the door of an Army vet because they heard he was growing some weed. When they mounted the assault he was inside with a gun and one cop was killed and five others were injured. How senseless was this cop’s death? Some people will use the argument, “Well, what he was doing was illegal.” C’mon, it may be illegal, but the level of force used here was a little excessive for growing some weed. Now if he was running a meth lab or had some hostages in the house or some such I could almost understand it, but for some pot? In this story the FBI chainsawed a woman’s door down, broke in and held her at gunpoint for thirty minutes while her three year old cried in another room. After awhile they figured out that they were in the wrong apartment – and that was after a two year investigation into drugs and weapons in that apartment complex. Seems to me that after two years they’d pretty much have some idea of the apartment the bad guys were living in. Innocent man shot to death on raid on wrong house. Editorial about black people being raided – cops bust in on judge’s family. All these stories are bad, but this one takes the cake. (If you have time you should read the full analysis by a former police officer here.) Jose Guerena was a Jarhead back after two tours in Iraq. He got out to join the Border Patrol, but couldn’t because of bad vision, so he got a job working at a mine to support his family. Apparently, and for reasons that I found less than compelling, he and some of his extended family were being investigated for drugs and weapons. At 9:30 am May 5, 2011 a Pima County, Arizona SWAT team assaulted his house and, from what I can tell through much reading, completely botched the entry and wound up shooting Jose twenty-two times. If you read the analysis you’ll understand the raid was part of a series of raids and that the affidavit was more of a fishing expedition than an actual drug bust based on facts. Jose was home sleeping after working the night shift at the mine. His wife and child were home as well and that morning she looked out the window and happened to see someone out back with a gun. (Her relatives had been hit not too long before by gunmen.) She called to Jose that there were people outside with guns, so he grabbed an AR-15, put his wife and child in the closet, and went to see what was going on. In the meantime the entry team lined up and knocked on the door. They waited seven seconds and then knocked it down. During the entry one of the police officers stumbled and accidentally fired his weapon causing the rest of the team to open fire and kill Guerena, who I might add did not shoot when he saw who he was facing. It seems that if his training was sufficient to hold his fire that the SWAT team’s should have been as well. Check out this video of the shooting. They shot between 70 and 80 rounds and it’s a pure miracle his wife and child weren’t killed or injured as well with the wild firing they were doing. When you watch the video remember that Jose never fired one shot in return. After all that no narcotics were found in his home. After Guerena was shot the cops left him laying there for over an hour before allowing EMS to help him. The SWAT team denied accountability for the outcome of this raid and were found to be not at fault by an investigation, which is the real tragedy if you ask me. The whole thing smelled of police cover-up right from the beginning. I would say that if someone suddenly knocked my door down and rushed into my house while I was sleeping my first reaction would be exactly the same thing. My question is, “What reasonable person would expect a man not to defend his house if he had the training and weapons with which to do it?” After all, there have been instances of criminals pretending to be police officers where innocents wind up as victims. Using this reasoning if someone breaks into your house and you meet them at the door with a gun pointing at them you might as well shoot whether it’s a bad guy or a cop. Why? Because if it’s a cop they’re going to see the gun and start shooting. Maybe you can get lucky and shoot first, after all they have the element of surprise. If it’s a bad guy he’s not breaking in to bring flowers to you and your family and poses a clear risk. Shoot to kill. Is The Militarization of Police Necessary? My question is this: is it really necessary for the militarization of our police force at this level? I’m not talking about tinfoil hat stuff here, but I’m concerned that local governments feel it’s necessary to send in assault teams for relatively minor things – especially when they sometimes hit the wrong home. Oh come on, Jarhead. It only happens once in awhile. Sure, no big deal until it happens to you. I don’t know about you, but I damned sure don’t want to be on the receiving end of something like this. Here’s a question that’s probably already been answered, but what happens if they break into my house and I happen to be sitting on the couch with my gun next to me and I get the drop on them? I’m sitting there in my nice quiet home and then bang! Three or more guys with guns come in and line up in the fatal funnel (see above video for how not to conduct a raid) and I just pick up my gun and start shooting. Let’s say I kill two cops before I realize what’s going on. If I somehow manage to survive the raid (doubtful) can I go to prison for that? As far as I’m concerned I was protecting myself and my family, but I doubt the law would see it that way even if I had nothing to hide. If this scenario hasn’t played out yet you can bet your bottom dollar it will before too long. I believe there are times and places for the SWAT team guys to do their thing, but I’m not sure that assaulting private residences is one of them. If there’s something in the house they want to see why not just wait until the suspect(s) come out and nab them then? Oh, I know it won’t always be that easy, but it beats knocking the door down of an innocent family and terrorizing or possibly killing some of them. Once again I feel like I’m leaving a lot of arguments half finished or unsaid, but I’m going to stop here due to the length of the post. Tell me what you think. Is it ok to have this threat of force hanging over your head? Hey Jarhead! There’s a drug war happening and sometimes you have to scramble a few eggs to make an omelet. Right? I know there’s a bunch of law enforcement guys that read this blog and I’d love to hear what you have to say about this. If someone broke into your house are you just going to sit there if you have the means to protect your family? Think carefully, because it is well within the realm of possibility. Previous PostHow To Prepare For The Hard Times Ahead. Those That Don’t Take The Time To Prepare This Time Are Not Going To Have Any Excuse. After reading this article, I am aggrieved for those suffering from police brutality. I do plan to protect my home with everything I have though, and If I can take few with me, then so be it. At my age, I have lived a good life and have no qualms about going to my maker, nor misconceptions about how militarized men have become brutal psychopaths because of how they have been programmed by the Stasi state. If these men actually believe that we are the enemy, they will be just a brutal as they believe they can get away with and deserve no second guesses when they come knocking. If I have done nothing wrong, and they come to my door, I will not hesitate. If you hesitate you will become a victim. Don’t believe for a moment that they will spare you if they are hyped up enough. 32 bullet wounds in a corpse? If that doesn’t tell you just how psychopathic they have become, you need to get your head out of your rear. ya know AZ ? why not READ YOUR BIBLE and co-relate THE WORD w/ your OWN LIFE or simply STFU as you DO NOT DETERMINE nor dispatch anyone anywhere. as for these abominations ? sooner rather than later, it WON’T MATTER anymore. when the SHTF, they will run and be w/their own families, NOT OUT screwing around directing traffic,shooting at folks etc. OH,and let me say something to you JARHEAD SURVIVOR,you need to start reading your BIBLE,so you know who’s,who,OUR LORD JESUS made it very clear who were the minions of SATAN,he told you if you fellowedshipped with them he WOULD SEND YOU TO HELL right along with them,AND right now you have one foot inside the gates of hell and the other on a banana peel,I guess the fact your hero’s TARGET PRACTICE shooting at pregnant women and children,went right over your JARHEAD……….. Protect your home and family against all psycho predators. Street corner thugs and jack booted government thugs will be met with hot lead. We are approaching the time where swat raids are going to be used on the populace en masse and it will be for reasons such as domestic terrorism. Examples of domestic terrorism include being a supporter of the constitution & bill of rights, being suspicious of the govt, being a veteran, or being a Christian. I will shoot anyone who tries to forcibly enter my home because I am dead anyway. We all are, just don’t know it yet. They are not there to protect you and me they are there to ‘police’ us for the corporation! They take OATHS to uphold the constitution but have never read it! Americans need to Abolish the UN and Hang all the traitors in DC!!!!!!! These officers would do well to consider what would happen if an individual found where the offending officers homes were and avenged the wrongful actions of those officers. I personally would not condone this, but, one must realize where this could go.